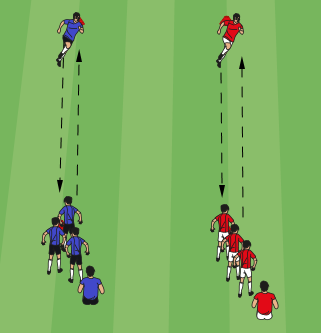 The dynamic relay warm-up drill gets players racing against each other while performing dynamic locomotions. It is great to use after a general dynamic warm-up. Set up relay lines with cones and divide players into even teams. This warm-up works best when there are 4-6 players in each relay line. To get players warmed up, begin with basic dynamic warm-up movements running to the cone on the other side and back at a lighter pace. Once players are warm have the teams compete in relay races using different movements and exercises. Relays can also work well with dribbling and passing skills. If teams don’t have even numbers, some teams may need to elect an individual to run twice so that all teams perform the same number of relay legs. Once a player finishes their leg of the relay, have them sit down to keep track of who has gone. The first team with all of their players sitting down wins. Players can get really competitive with this. Perform multiple relays and keep track of how many relays each team has won. There are plenty of different variations coaches can use for this drill. In addition to different forward and lateral movements, players can perform body weight exercises when they get to the opposite end. A coach can have players perform things like 5 push-ups, 5 sit-ups, 5 body weight squats, 5 jumping jacks, 5 burpees, or 5 tuck jumps before returning. Encourage everyone to try their best. If one team is dominating, shuffle the teams to keep things close.